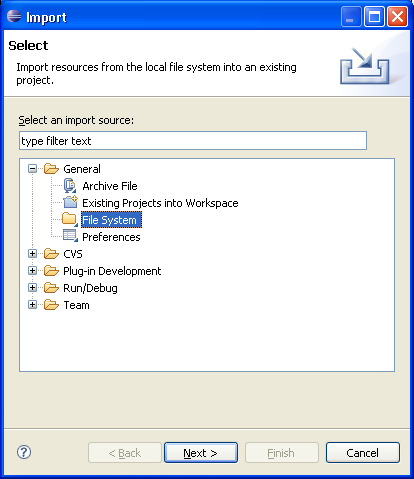 You can add a wizard to the File > Import menu option in the workbench using the org.eclipse.ui.importWizards extension point. The process for defining the extension and implementing the wizard is similar to org.eclipse.ui.newWizards. The primary difference in the markup is that import wizards do not define or assign categories for the wizards themselves. The wizards appear uncategorized in a wizard dialog. The wizard supplied in the class parameter of the markup must implement IImportWizard. Its pages are typically extended from WizardImportPage.